Having lived for three years in Nashville and developed a fondness for the place, I was glad to see the city get some coverage in a recent post by Kaid Benfield on the city's plans for developing a regional transportation network. In addition to its plans for the region, Nashville has revamped its zoning code, adopting in 2010 what is in substance, if not in name, a form-based code for its downtown. The changes are some of the most promising I've seen in any code revision for a major American city, including the repeal of most of use-based zoning limitations and the elimination of all parking minimums within the downtown area. It's a long overdue change for a downtown with a particularly tragic 20th century planning history. An 1860s view, at right, shows a city built densely along the Cumberland River, with the city hall and courthouse placed in the center of a large square (the Public Square). The state capitol building sits on the point of highest elevation, just north of the main commercial area. 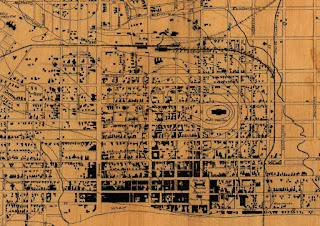 The grid was less rigorous here than in some cities, with a variation in street widths and an allowance for adaptation which permitted the emergence of alleys and narrow streets along and across blocks, resulting in a fine-grained urban fabric. Even as early as this era, however, a trend toward a city of detached single-family homes is clearly evident. The path of the railway line, meanwhile, anticipates the subsequent blighted industrial belt and inner ring of Interstate 40. 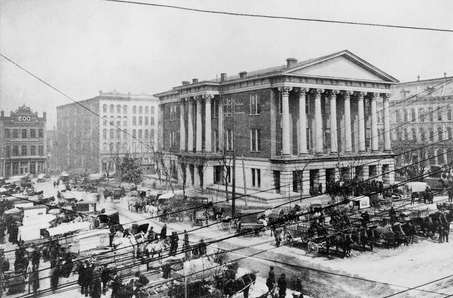 The Public Square circa 1890. 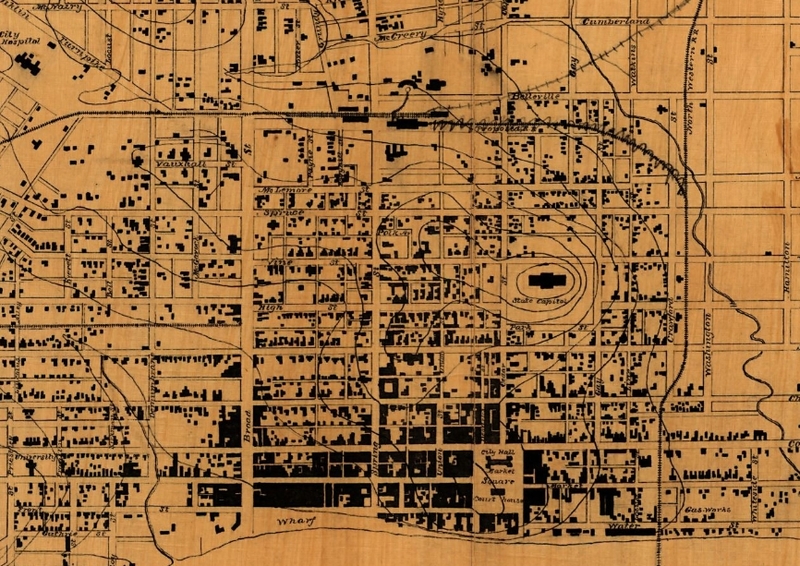 Nashville was one of the first cities to pounce on urban renewal funds following the Housing Act of 1949, acting swiftly to draw up plans for clearing large swathes of the city (clearance work around the capital had been ongoing since the 1930s). The Public Square, seen as decrepit and impeding downtown business retention, was obliterated: the courthouse and town hall were torn down, and the buildings surrounding it razed. Along its margins, a new bridge carried six lanes of traffic into a widened Union Street. An intricate network of alleys was neglected or abandoned, leaving Printer's Alley, a one-block stretch of shared space traditional urbanism, as a reminder of the past. Poor residential neighborhoods surrounding the downtown were cleared en masse and rezoned for industry in an attempt to retain the city's manufacturing base. The piecemeal development occurring prior to 2010 has not necessarily come together to create a compelling urban environment, as setbacks and parking requirements have combined to result in fragmented development with little sense of spatial enclosure. The entire elimination of parking minimums, without the imposition of maximums (p. 80; Market Urbanists take note). This shames the much-touted Miami 21 code, which has retained high minimums. A de facto abolition of Euclidean zoning. Although a use chart is presented in hyper-detailed Euclidean format, virtually all uses, except for heavy industrial and some automotive businesses, are allowed, essentially creating a "general urban" zone along the lines of those found in Paris (p. 57-58). Abolishing most setback requirements, and instead requiring that buildings occupy at least certain proportions of their street-facing frontage. The establishment of height limits, with bonuses for incorporating certain features, including LEED certification, open space, certain types of parking (underground or above ground but "lined") and affordable ("workforce") housing. Height bonuses: most are well-intentioned but counterproductive. A bonus for public "open space" reflects a suburban aesthetic and incentivizes the tower-in-the-park form, contrary to the stated goals of the new code. A bonus for certain types of parking would appear to incentivize parking, even if the code does not require it. If there are no parking minimums, why not provide a height bonus for little, or no parking? Or only underground parking? Streets and blocks: to its credit, the code addresses this issue, proposing a handful of new streets to improve connectivity in certain areas. As can be seen in the above image, however, the existing street network is, in places, grossly inadequate, with overly wide blocks and insufficient north-south streets. The urbanization of this area, if it is to be effective, will require the opening of many new streets to bring blocks down to mangeable, pedestrian-friendly dimensions. Existing plans are too tentative. Narrower streets would have an important role to play here. Despite these drawbacks, Nashville's new code for downtown is a remarkable achievement, and ought to serve as a model for cities like it, or for any cities, for that matter. Expanding it beyond the downtown area would be a major next step, but the selective loosening of regulatory constraints in that one location may encourage a beneficial funneling of real estate investment into long neglected central areas. The Nashville Civic Design Center, which is staffed by some dedicated urbanists, has spent years working on plans for downtown neighborhoods, and has a wealth of articles, photos and plans on its website for those interested. I'm definitely happy to hear about the no minimum parking requirement. It will be interesting to see how the private sector deals with that in an area which is heavily car dependent. Will the developers all be afraid of being the first to cut out parking? Or will they figure out how to properly price it and share it? I find the parts about street design somewhat disconcerting. They seem to still have that obsession with "Grand Boulevards": the "Primary Streets" are anticipated to have the heaviest pedestrian and automobile traffic, while small streets and alleys are not meant to have much at all but "loading and access." Also, the requirement of "quarter acre per quarter mile" of open space is curious. It sounds like not so much actually. But on the map they draw, they seem to be rather unhappy with the very copious amount of open space they already have. P.S. Did you post a "Friday read" on Mumford that somehow got deleted? Matthew: great observations. I'm not aware of any major projects which were entirely conceived and planned after the adoption of this code, so no sign just yet of how the market will respond. Given the current setting, I suspect parking garages will be included regardless of what is required by the code, though hopefully in lesser quantity than before. The conception of streets, as you mention, falls very much within the 19th century street/alley dichotomy, but I would hope that, in practice, these distinctions might fall away a bit. Still, the descriptions given in the code are a bit of a mess, to put it charitably. Broadway, the "primary" street shown, in fact serves a very modest amount of car traffic (since it effectively dead-ends at the river), and could easily be 30-40 feet narrower without impeding vehicular flow. The treatment of alleys as service ways, common throughout New Urbanist projects and literature, is annoyingly persistent, and even less excusable here with the example of Printer's Row close at hand. As long as narrow streets are allowed (and there do not seem to be clear limits on street width) a clever developer can work around these guidelines. The concern with green space is a bit obsessive. The Bicentennial Mall, aligned with the capitol, is a clear nod to the mall in Washington, yet is little used to its near-total lack of adjoining residential and office space. And yeah, the post on Mumford went missing for reasons I'm not clear about, although I still have much of it saved in draft. I plan on bringing it back out on Friday. The absence of parking requirements at least opens up for some flexibility and creativity on the part of the development community. It will be exciting to see how this shapes growth over the coming decade. I especially like the references to the past. It is good to reference the past too - despite the xenophobic shortcomings in their earliest forms, our older zoning bylaws espoused many principles that we need to re-embrance. I'm glad you mentioned the lack of a fine grained street grid as an impediment to future urban development. This is an unappreciated challenge of retrofitting sprawling environments, and most cities don't have the mechanisms and processes in place to ensure new connections and streets are established as future development occurs. Yes, it's very easy to end up with a fragmented development pattern. 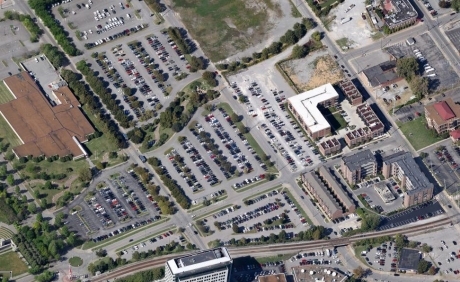 The area around downtown Nashville shouldn't be suffering from lack of connections in the way that suburban sprawl often does, but urban renewal carried away not only the buildings but much of the street grid in the area to the west of downtown. Some of the current blocks are 370' by 1000', meaning that they could accommodate six or seven cross streets. I am reading your article and title and it suggests this is a downtown revision. If this is true, then I do not agree that the elimination of setbacks and parking requirements (or at least vastly reduced requirements for parking) and the reduced emphasis on use is so ground breaking. Many a downtown is treated this way. Maybe the downtown you speak of is very broad and includes the central business district and surrounding neighborhoods? Essentially, the zone has been taken out to the limits of the existing single-family detached suburbs, about as far as it could reasonably go. Other cities do have similar zones, but even for a place like Kansas City, with a metro population 33% larger than Nashville's, the area exempted from parking is barely 1/3 the size. This is great for Nashville and shows a real commitment to improving downtown. Nice! These Article About Parking Gatwick is very useful!. I really, really like Nashville Car Service. While it has been acknowledged that it has an important part to play in the development of man, several of today’s most brilliant minds seem incapable of recognizing its increasing relevance to understanding future generations. Since it was first compared to antidisestablishmentarianism much has been said concerning Nashville Car Service by the over 50, whom I can say no more about due to legal restrictions. Keeping all of this in mind, in this essay I will examine the major issues. Greening the DC Zoning Code?